My Sunday dinners in the past have included a roast beef or chicken, mashed potatoes and gravy, veggies, salads and pie for dessert. In our family, we typically only had the traditional Sunday dinners on long weekends and holidays like Easter Sunday and Thanksgiving. John and I have friends who enjoy a Sunday dinner with friends and family each week. Our version is much smaller since we have no family around where we live. I miss getting together with family friends to share a delicious home-cooked meal. Sunday dinners have traditionally included a roast as the main course. However, this tradition has evolved over the years and your Sunday dinner can really be whatever you want it to be. All that really matter is that the the food is prepared with care and love and you are spending time enjoying the company of family and friends. One of my personal favourite type of fare for Sunday dinner is chicken. I love that it’s easy to prepare, readily available in our small town grocery store and always a crowdpleaser. I’ve rounded up my pick of the best 15 delicious chicken recipes for Sunday dinner. These are all recipes I would personally serve to my family and friends and I tried to come up with a diverse selection. If you’re in a dinner rut and not sure what the main dish should be for your next Sunday dinner, you can come back to my Foodie collection for recipe inspiration. Which chicken recipe from my Sunday Dinner collection is your favourite? We usually eat a lot of chicken at our house. So I’m am always looking for new ways to make it so we dont get tired of eating the same thing all the time. Thanks for all the new recipes to try. Thanks for sharing this! Chicken is a must have meat in our home so we will def enjoy some of these recipes! This is great. I love making chicken in different ways to change it up. I love chicken recipes!! Thanks so much for all the great ideas!! Chicken is a staple in this house and I am always looking for new recipes so I will definitely check these out, thanks for sharing them. Chicken is an old stand by but I’m definitely bored of it and need some new recipes! You can do so many different things with chicken. ok so great tips. my only problem is chicken is hard for me to cook! im new at cooking and i have a tough time ! :) can you write a post about how to cook chicken? lol for new beginners like me! We have chicken almost every night in my house. These recipes will be a great addition to mine. I love trying different recipes. My favorite recipe from your Sunday Dinner collection is fried chicken, nothing beats a great fried chicken recipe. Thank you for sharing these recipes. 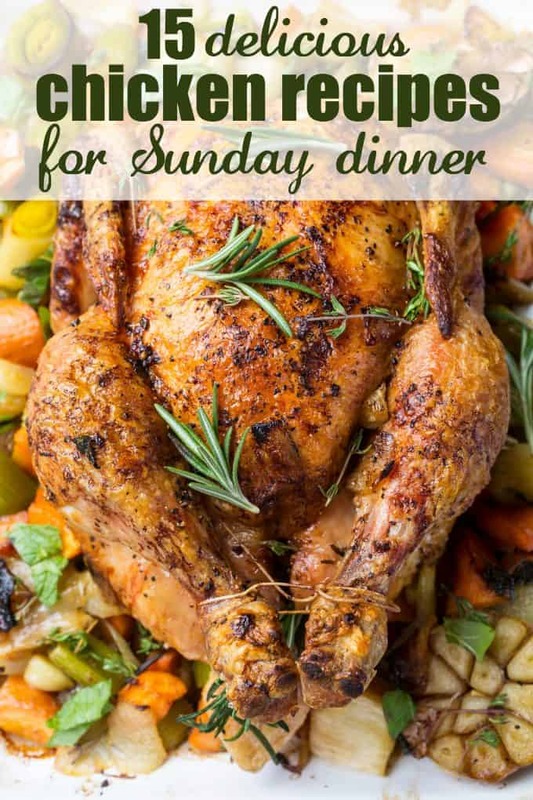 rosemary roasted chicken looks really good, love sunday dinners with the family! We eat alot of chicken here. Thank you for the great recipes. I am always looking for good recipes to try. I love ANY chicken recipe and these ones look so delish! I must try some!! We eat lots of chicken so I’m always looking for new recipes. Thanks for the ideas. We eat a lot of chicken here too, I love doing a whole roast chicken in the crock pot (always put tinfoil balls on bottom of crock pot – it helps keep out of the liquid) I would love to try your fried chicken recipe! Thank you for the recipes. I’ve been looking for alternative ways to cook chicken, been really bored with the same old thing. Will have to try a few of these. These look great, my family used to always get together for Sunday dinners, it was so special. I connected to your foodie acct. I can’t wait to try some of these recipes! We eat a lot of chicken in our house. I just signed up for Foodie! Thanks for the info!! I love chicken and we cook it a lot!! Oh yum! Bookmarking for future dinners!! Oh, I would like to try the Jamaican Jerk Chicken. That looks and sounds really good. It sure would change up our menu too. I heard Jamaican Jerk was awesome so Im ready to give it a try.